John was born about 1831, died on 8 Apr 1892 in Launceston aged 61, and was buried on 10 Apr 1892 in the Charles Street Cemetery, now Ockerby Gardens. Although he was always thought to be of Scottish origins his death certificate states that he was born in Ireland. John married Janet McLean on 16 Oct 1857 in Launceston. Janet was born to Hugh Mclean and his wife Mary McInnes in 1830 at Arinagour, the port and main town of the lsle of Coll, Scotland. She was christened at Arinagour on 14 Jan 1830. 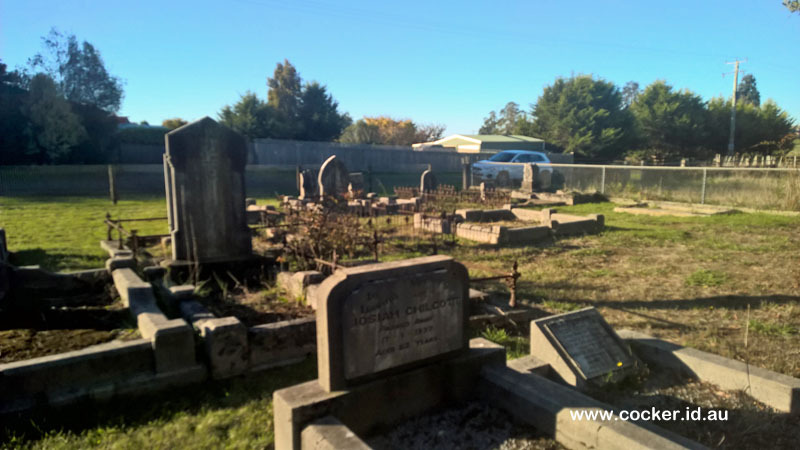 She died on 6 Nov 1867 in Leven, Gawler River aged 37, and was buried in the Methodist Cemetery, North Motton, picture below today. John next married widow Elizabeth Jackson nee Gordon on 23 July 1875 in Launceston. 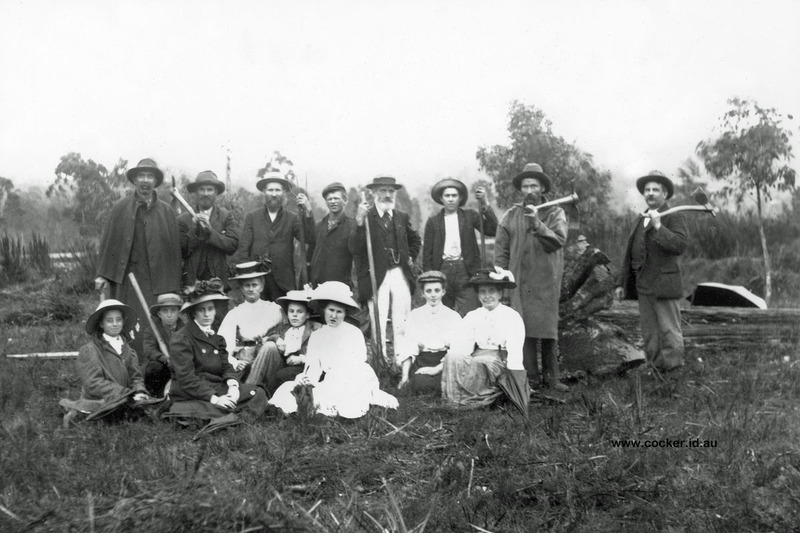 John McHugh emigrated in the 1850's and settled first on a selection of virgin bush on Skeleton Creek at North Motton, south-west of Ulverstone. He married Janet McLean at Launceston on 16th October 1857. Their first son, John, was born at Launceston on 18 Jul 1858 and second son, Hugh, on 7 Aug 1859, also at Launceston. Both their birth certificates list father's occupation as labourer. In the summer of 1859 - 1860, as recorded in his book 'Bushlife in Tasmania' written by James Fenton, noted early Tasmanian historian, 'Mr. McHugh was a resident at North Motton in those days and there was a track up to his house near the source of Skeleton Creek.' A newspaper report dated 21 Mar 1863 about a fire on the McHugh property at River Gawler refers to house, land, crop, kiln and pottery. In 1873 John started his pottery in Launceston at the Sandhill, where there was an abundant source of clay. It would appear that he ran this business alone, but it would be fair to assume that his sons, the oldest of whom would by then be in their teens, would have worked with him, making flower pots, pipes and other household wares. By 1876 an article in the 'Examiner' newspaper dated 25 Jul 1876 shows that he was producing a wide range of earthenware and that he was assisted in the business by three of his sons. A Deed of Partnership dated January first 1890 gives details listing brothers Hugh, James and Edward as partners with step-brother James Jackson. Also the proviso that the sum of two pounds per week was to be paid to John McHugh, a retiring partner secured to him by a Deed of Dissolution dated 31 December 1889. 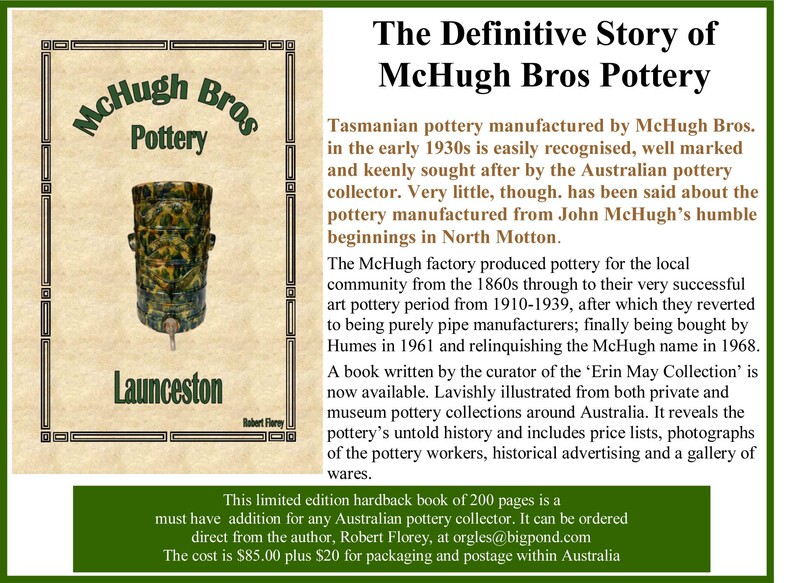 McHugh Pottery became, not just a household name, but a thriving and innovative business which made a signifcant contibution to the growing prosperity of Tasmania. A detailed history of the pottery and a portfolio of the beatiful artware products will be added to this site later in 2016.